It is difficult to deduce an opinion from something which you feel you didn't really experience in the way it was intended to be. 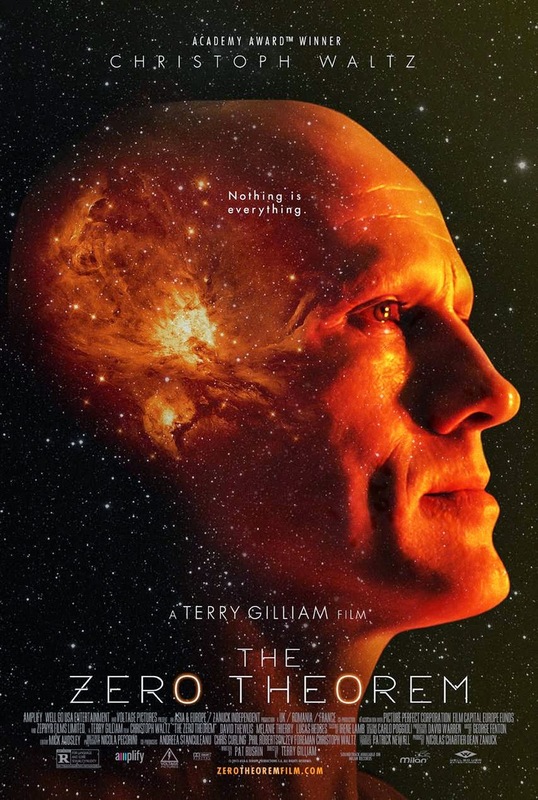 I watched Terry Gilliam's latest fantastical daydream on my laptop after renting it from Amazon, but the impact wasn't nearly as thrilling given the themes and ideas it seems the director intended to touch on. As with many a Gilliam film, the visuals are key here and the environment is overpowering to the transparent dialogue that changes up speaking patterns and use of words to seem different or original, but evoke little meaning in their change. Throughout the entire film our lead character, Qohen Leth (Christoph Waltz), refers to himself in plurals and though this is meant to suggest some type of existential meaning where he is all and all are him, we aren't ever really given clear reasoning as to why this guy is such an oddball besides the fact he lives in a similarly crazy-seeming world. It is this kind of mentality, this type of "off the beaten path" style for the sake of being different that is more irritating than innovative and if anything it seems Gilliam is splashing together little bits of his filmography to create something as outlandish as ever, but the issue is that none of it sticks. I enjoy a good conversation about the point of life, where we come from, faith, God, science, family, humanity and all of that stuff (good stuff that serious conversation and insight can produce) but screenwriter Pat Rushin, in his feature debut, has given Gilliam nothing particularly insightful or revelatory to work with other than asking the question of why one might want to prove that everything is for nothing? What would be the point Qohen asks? There is no thoughtful response though, there is no epiphany that comes forth to his apparently genius mind, but rather we are left with an age old John Lennon sentiment that doesn't so much invigorate us about our psychological state of being, but more comforts our human condition in flowery ways because the film is written with such flowery language. Qohen Leth (Christoph Waltz) is not keen on venturing into the outside world. Finding himself suffering existential angst, Waltz's Qohen constantly waits for an event in hopes it might bring him happiness and the answers to the universe he so greatly desires (Is this just a way station on the promise road to some great eternity?). Qohen works for a huge corporation called "Mancom" where he is made to "crunch entities" which to us means he does a bunch of crazy things with glow sticks and bicycles. In fear of missing his precious sign from the universe Qohen requests a psych evaluation so that he might be granted the opportunity to work from home (thus giving Peter Stormare and Ben Whishaw reason to show up). Their diagnosis leads to both a recommendation of therapy sessions with Dr. Shrink-Rom (Tilda Swinton) as well as the granting of his wish to work from home by "Management" that is embodied solely here by Matt Damon. In the stress of attempting to get this set-up worked out with "Management" Qohen attends a party hosted by his supervisor, Joby (David Thewlis). At this party he has a run-in with Bainsley (Mélanie Thierry) a sexed-up younger woman who shows him more affection than is necessary, but to which Qohen can't fully reject due to his natural instincts. Once he begins working from home (which is an old abandoned cathedral of sorts), Qohen is required to solve what is called "The Zero Theorem," or a mysterious mathematical formula that might unlock the meaning of life. Qohen spends months and months working on the program, to the point he doesn't see the outside world for over a year and in the midst of his frustration at not cracking the code he cracks the screen of his super-computer, his only tool to solve the theorem. Once the cracks begin to show "Management" sends in his teenage son, Bob (Lucas Hedges of Moonrise Kingdom), to repair Qohen's computer, but in the midst of the two getting to know one another Bob divulges a fair amount of information not apparent to Qohen or his micro-managed world that opens numerous doors to different possibilities. The two of them team-up in a strange way that pits them as the scorned son and former employee seeking to break free of the cycle they've become purposefully trapped within. 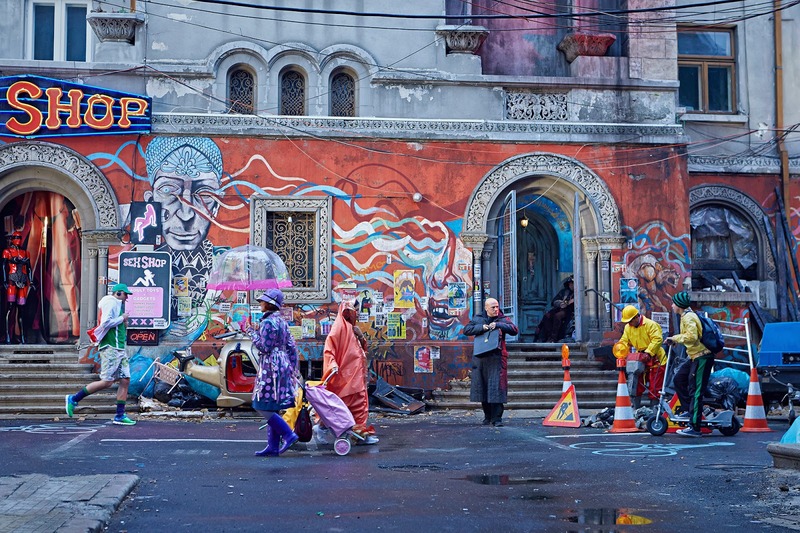 The Zero Theorem begins and ends with a naked Christoph Waltz on two opposite ends of the emotional spectrum. To which emotions those are is easy to guess, but it is how this specific personality comes to have a change in attitude, in perspective that is the most interesting thing about the film with all the distractions around it only serving to up-end the work Waltz is doing. In many ways, the film and Rushin are deconstructing the importance placed on individualism in our society as everything about the world Gilliam has built to represent Rushin's words exemplifies how one can get ahead, become rich, buy things for up to one hundred percent off the original price. Everything revolves around pushing one further into prosperity in hopes that this might preoccupy them from thinking about things beyond themselves, deeper things that have to do with the benefit of the human race or the planet we live on (why does Gilliam insist on making the streets cluttered with trash and the walls ripe with stains and misplaced art?). It is the overseer's hope that the human race will continue to fight and disagree because chaos pays and peace, well peace is just people sitting around contemplating the bigger schemes of life, trying to make the most out of the time we have which, in any logical persons mind, wouldn't be wasted on conflict. When it comes to our protagonist though, he is disregarded as insane due to the fact he is searching for such things, he does question what the point of it all is, if there is meaning to his existence yet as he waits for a sign, or more specifically a phone call, he is also wasting his life alone and in fantasies that "Management" has constructed to divert his quest from inching closer to the destiny he imagines has to be true. It is in that Lenon line of thought that, "Life is what happens while you're busy making other plans," where The Zero Theorem takes notes and teaches Qohen he has the power to control his own destiny, but again it is the journey to this less than satisfactory epiphany that makes the experience not as wonderful a concoction as it seems upon first impression. Bainsley's (Melanie Thierry) motives are not all that clear when she visits Qohen at his home. I understand that there are likely many themes and ideas that went over my head as I tried to take on the precisely detailed world that Gilliam has created here on my laptop screen, but I also came to justify my experience with the film as those elements not being the ones that should define what I took away from the film, but rather how much they should enhance the ideas that the creative team behind the film were trying to express. As the film comes to an end and I am left wondering what the throughline of thought was, who Matt Damon was actually intended to represent, what part of the brain Tilda Swinton was meant to breathe life and sense into or if Mélanie Thierry was indeed a soul with which Qohen could find peace or just another program, a figment of the digital world that Qohen has come to find as more of a reality than the actual world outside-I was lost. Truth is, as much as I was interested in the ambition of this project and the earnestness with which Gilliam approaches these ideas I wasn't left with anything inspiring or a thought that sparked an idea within me which, maybe selfishly, is what I expect from a movie that digs into the core reasoning of psychological and existential crisis's. One could go on to talk about how, despite a certain lack of substance, the way Gilliam dresses things up in eye-popping decor while costuming his characters in outlandish outfits making every frame look as if it's a futuristic comic book should be enough compensation for that lack of depth-but we all know it's not. Gilliam also has an eye for the trashy futuristic setting (as I mentioned above) that only serves to make the film look as if it were taken from the set of a Paul Verhoeven flick. It's not that this style adds or detracts to the overall quality of the film for me though, sure there are certain sets that look interesting and impressive on film, but more than anything it feels like Gilliam is trying to distract us from the shortage of profundity and wisdom that he would like those coming into the film to think it possesses. You could also go on about the performance of Waltz, but he is always strong and that is a given, so if you're going to see this for anything see it for his one-man show.